Enter your library email address to hear about new programs available each season. iREAD Summer 2019 theme: It’s Showtime! Join us for this modern twist on a classic silhouette portrait. Choose a profile to draw freehand (or trace one of the provided printouts). Then let your imagination take over and fill in a painted design using watercolor pencils under Christine's guidance. Come learn about the fascinating artist Gustav Klimt and make your own painting inspired by his work. Art teacher Christine Thornton will teach you how to use metallic paint and colored pencils on black paper for this fun, easy process. Come learn about henna hand designs from India and other kinds of traditional body painting from around the world. Then practice sketching popular henna motifs and paint them on your own hands with washable water color pencils. A fun multicultural program! We'll learn about the sacred Mexican holiday Dia de los Muertos and some of the cheerfully creepy artwork that comes with it. Then we'll make our own drawings inspired by colorful sugar skull candies. A fun multicultural program! Learn to paint this beautiful scene. Christine will teach you some fun, easy techniques using watercolor pencils, brushes, and stamping with plastic wrap. Perfect for fall. Celebrate fall with a seasonal painting workshop. Christine will guide you through a fun, high success painting process. First we'll draw birch trees on watercolor paper and outline with permanent marker. 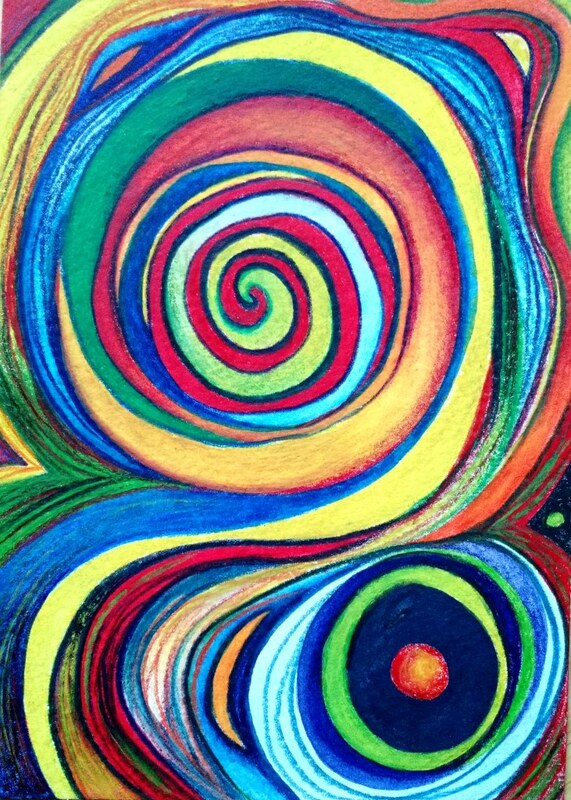 Then learn to use watercolor pencils to add vibrant color to your painting. Northern lights soar above a cozy winter cottage nestled in a pine forest. Learn to use some basic watercolor pencil techniques like gradated washes, wet on wet, dry brush and more. Then create your own beautiful painting under the guidance of art teacher Christine Thornton. 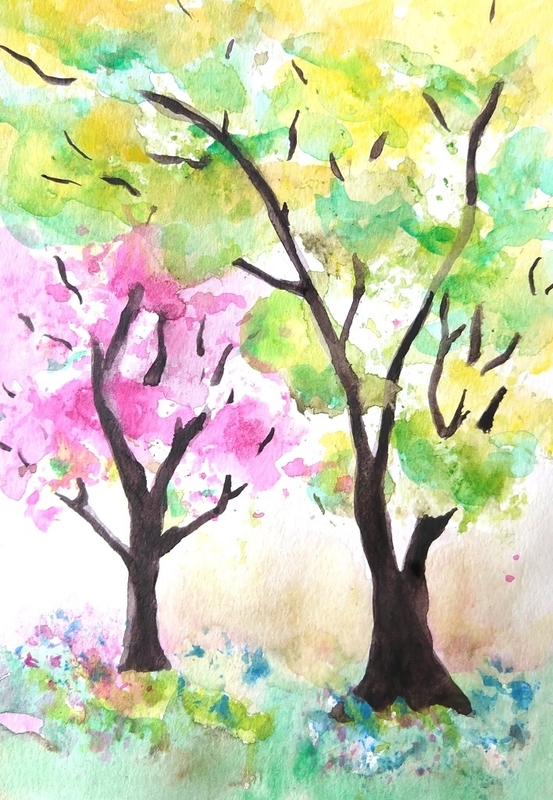 Learn to paint these beautiful flowering trees. Christine will teach you some fun, easy painting techniques using watercolor pencils, plastic wrap and brushes. Perfect for spring and summer. Celebrate your favorite Chicago team with this fun painting workshop. We'll talk about how sports logos are designed. Then you'll choose your favorite team logo, learn to transfer a drawing to watercolor paper, outline with sharpies, and add color with watercolor pencils. No painting experience required. If you like drawing faces and want to improve your skills, this class is for you. Working in pencil, we'll learn about proportion and placement of features, how to draw hair, shading and more. Improve your drawing skills in this fun class. We'll cover the basics of drawing faces in the Japanese style of Manga including expressive eyes and fun hair for both boys and girls.